Veeps, Fastballs, and Slow Death. Bill Radke: First, we hear from Josh Flick, kitchen manager at the Fiddle Creek Steakhouse. Josh Flick: Here at Fiddle Creek Steakhouse you can get the exclusive Alien Secretion shot. 1/2 oz. of pineapple juice. I have noticed that the kids are running around with their tin-foil hats on because they don't want the aliens to read their minds. I guess they got that off of a movie or something. The business are cashing in off of the tourism. They have cute signs posted like: "UFO Parking in the Rear" and "UFOs Welcome." Gary Warren: Well, on our marquee we put up "UFO Parking Out Back." That's Gary Warren, a manager at Stephenville's Chicken Express. Gary Warren: Since the UFO sighting early in January, I have noticed quite an increase in traffic, people coming to investigate. Most of the people that had the sighting we've known for quite a while so they are very credible people. And they saw something, they just aren't sure what it was, and I am not sure what it was, but I think that's why its called a UFO. For Stephenville, anytime you can get in the spotlight its good for us. We have always been known as the cowboy capital of the world, now I guess we'll be known as the UFO cowboy capital of the world. Crystal Gilkey: My name is Crystal Gilkey, and I am at Jake and Dorothy's Cafe. The weekends have been busier since the sighting. This last weekend we actually had our busiest day in 2008, and it's usually pretty slow in January, so it was actually pretty good for us. There's just been a lot of hype around it. People wearing foil hats. There's a place in town, Barefoot Athletics, that's selling T-shirts. It's just been crazy. Matt Shaw: I work at Barefoot Athletics in Stephenville, Texas. Once word got out that we were selling these shirts we had a lot of visitors from the state of Washington, Alabama, just all over the United States have actually been in. It's been kind of a windfall for our business we screen print T-shirts so its been pretty exciting. 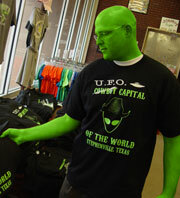 They are black with kind of florescent green ink, and we are known as the cowboy capital of the world and we put that, then crossed out the word cowboy and then put "UFO Capital of the World" with an alien, or what we assume an alien looks like with a cowboy hat on. Josh Flick: This weekend I'll be looking up in the sky watching out for the UFOs.